I didn’t mean to write about two Raoul Walsh movies in a row, but that’s the way it’s worked out after last week’s post on DESPERATE JOURNEY. 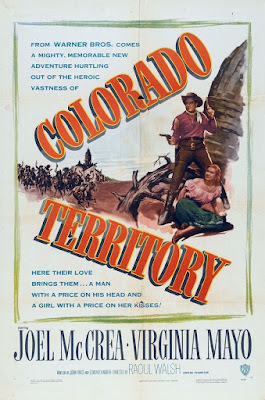 COLORADO TERRITORY is a Western remake from 1949 of the Humphrey Bogart classic HIGH SIERRA, also directed by Walsh eight years earlier in 1941. Both are based on the novel HIGH SIERRA by W.R. Burnett. In COLORADO TERRITORY, Joel McCrea plays outlaw Wes McQueen, in prison for robbing banks and trains, who is broken out so he can take part in a payroll heist from a train in Colorado. Along the way there, following the same general outlines as the story in the first film, he encounters a farmer (Henry Hull) and his daughter (Dorothy Malone), who are heading west to make a new start. McQueen falls for the girl, of course, and starts to think about going straight and making a new start for himself . . . after this one last job, of course. COLORADO TERRITORY, despite its Western setting, is pure film noir. 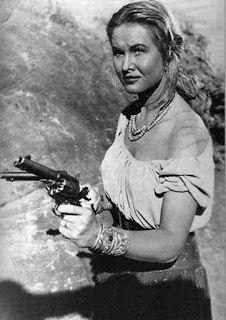 The other members of the gang, once McQueen meets them, can’t be trusted, and they have a beautiful dance hall girl (a perfectly cast Virginia Mayo) with them who stirs up even more trouble among thieves. Double-crosses and plot twists abound, and McQueen’s goal of giving up the outlaw life seems more and more out of reach. Will fate catch up to him, or will he manage somehow to avoid it? This is a wonderful film, very well-acted by a good cast and directed with great skill by Walsh, who balances the action and characterization about as well as I’ve ever seen. The train robbery sequence is excellent and had me grinning all the way through it. The stunt work is top-notch. The gritty black and white photography is very effective, too. I remember watching this movie on TV with my dad when I was seven or eight years old. All the more adult stuff went over my head, but I’ve never forgotten the closing scenes set in an abandoned Indian cliff dwelling known as the City of the Moon. No spoilers here, but that was the first time I had encountered such an ending, and it’s stuck with me for nearly six decades since then. You don’t hear much about COLORADO TERRITORY anymore, but it’s a classic Western and gets a high recommendation from me. I watched this about a month ago with my dad on the GRIT channel, which is a motherlode of old-school Westerns. A very cool flick and I noticed the noir elements as well. A classic. If watching two Raoul Walsh movies in a row is wrong, I don't want to be right.